This very lengthy book involves a lot of very intricate battles against two tribes living in what is now modern day Iraq, in 3154 BC. When the book opens, Eskkar the leader of the Akkadians beats the Sumerians in a very decisive way and punishes their king by hacking his right hand off. He then ransoms the life of the king for a huge sum before releasing him. As he does not trust the Sumerians to remain peaceful for very long and as the latest battle has decimated the Akkadian army he resolves to use some of the ransom money to start preparing a new, more efficiently trained one. With the support of his very influential wife Trella, he organises his generals in a softly, softly approach to raising a new army. The generals are all tasked with optimising their individual skills whether that be training infantry, cavalry, or other skills in the army. The generals and their trainees are sent out of the capital Akkad to distant training camps for very long periods, many months in order to build up their men's skills and equip them for battle. To provide funds to pay for all the training and purchase of fresh armaments the wife of the king, Trella sends a mining engineer to investigate and start on an industrial scale the production of gold, silver and other precious metals. She also arranges for spies to be sent to the Sumerian capital to investigate what they are up to. The Sumerian king who was returned to his people after the payment of a ransom is murdered by his own son and daughter, who then elect themselves King and Queen in his place. In order to avenge their peoples defeat by the Akkadians, the son starts to train, in secret, a vast army, and also forge alliances with other cities. There are scenes of the most barbaric torture and general skulduggery but these are juxtaposed with others of loving but very physical relationships between husband and wife or incestuous ones between sister and brother! The ultimate part of the book is focused on the battle that the two tribes have prepared for and it is a frankly awesome piece of writing as the battle includes both land and naval forces fighting each other in hand to hand combat. The author in an afterword explains that the final battle plan used by Eskkar had been criticised by some readers as too ambitious, too risky and bold for people of that time but says in his defence that Alexander the Great in The Battle Of Gaugamela used the same battle plan. This book was long because the story, which was proceeded by two prequels, needed a lot of description to remind the reader of what had occurred before which was useful as this was the first time I've read anything by this author. So the book was completely self contained and it is unnecessary to read the earlier ones. It is loosely a book of historical saga fiction, but I suppose it could be enjoyed by lovers of fantasy, as who really knows what happened at the beginning of the Mesopotamian civilisation? One just cannot fault the plotting of this story. The very meticulous level of detail of all the armaments and boats and general descriptions reminded me of books set in more recent times by authors such as Tom Clancy and the general writing skill of this American author reminded me of similar work I've read in the past by authors such as Bernard Cornwell, Wilbur Smith and Simon Scarrow. 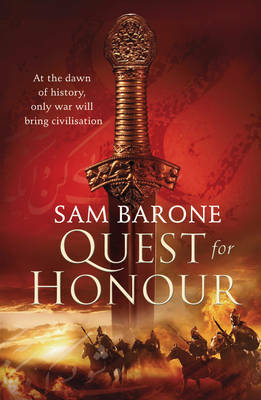 QUEST FOR HONOUR was very entertaining and I enjoyed it very much. I will certainly look out for further books by him in the future. NB. This title was previously published as a trade paperback as CONFLICT OF EMPIRES.